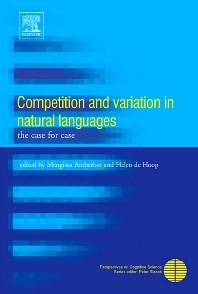 Competition and variation in natural languages: the case for case. (M. Amberber, H. de Hoop). Some participants are more equal than others: Case and the composition of arguments in Kuuk Thaayorre. (A. Gaby). Head marking and dependent marking of grammatical relations in Yurakaré. (R. van Gijn). Case pattern splits, verb types, and construction competition. (A.L. Malchukov). Limits to case – a critical survey of the notion. (A. Spencer, R. Otoguro). Case as feature checking and the status of predicate initial languages. (L. deMena Travis). The case of Basque: an accusative analysis for an ergative system. (M. van de Visser). Noun phrase resolution: the correlation between case and ambiguity. (P. de Swart). Changes in case marking in NP: From Old English to Middle English. (C.L. Allen). The on-line resolution of subject-object ambiguities with and without case-marking in Dutch: evidence from event related brain potentials. (M. Lamers). Differential subject marking in Amharic. (M. Amberber). Differential case-marking in Hindi. (H. de Hoop, B. Narasimhan). This volume combines different perspectives on case-marking: (1) typological and descriptive approaches of various types and instances of case-marking in the languages of the world as well as comparison with languages that express similar types of relations without morphological case-marking; (2) formal analyses in different theoretical frameworks of the syntactic, semantic, and morphological properties of case-marking; (3) a historical approach of case-marking; (4) a psycholinguistic approach of case-marking. Although there are a number of publications on case related issues, there is no volume such as the present one, which exclusively looks at case marking, competition and variation from a cross-linguistic perspective and within the context of different contemporary theoretical approaches to the study of language. In addition to chapters with broad conceptual orientation, the volume offers detailed empirical studies of case in a number of diverse languages including: Amharic, Basque, Dutch, Hindi, Japanese, Kuuk Thaayorre, Malagasy and Yurakaré. The volume will be of interest to researchers and advanced students in the cognitive sciences, general linguistics, typology, historical linguistics, formal linguistics, and psycholinguistics. The book will interest scholars working within the context of formal syntactic and semantic theories as it provides insight into the properties of case from a cross-linguistic perspective. The book also will be of interest to cognitive scientists interested in the relationship between meaning and grammar, in particular, and the human mind's capacity in the mapping of meaning onto grammar, in general. The volume will be of interest to researchers and advanced students in the cognitive sciences, general linguistics, typology, historical linguistics, formal linguistics, and psycholinguistics.